What the world needs right now is a few more coaches (ICF) – Learn differently. Think outside the words. In Pakistan it is a blessing that the concept of coaching is picking up. Life coaching, executive coaching, sports coaching are now becoming popular. Some of the coaches with whom i have the opportunity to interact are Qaiser Abbas, Farhad Karamally, Kamran Sultan, Arsalan Larik, and Fakiha Imran. 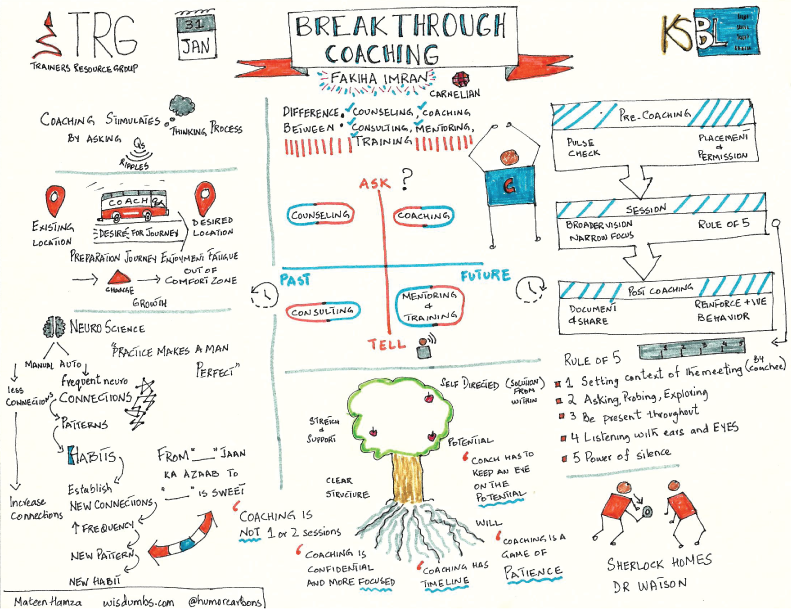 Recently, Trainers Resource Group (TRG) organized an event titled “Breakthrough Coaching” at Karachi School of Business and Leadership (KSBL) on 31 January 2019. The key note speaker of this session was Fakiha Imran from Carnelian. I attended the session and my visual summary of this session is attached herewith. I hope it will be useful for people who were unable to attend the session. It will also be a good learning and retention tool for those who attended the session. Next How to improve your LinkedIn profile.